KFC, also known as Kentucky Fried Chicken, is an American fast food restaurant chain that specializes in fried chicken. Headquartered in Louisville, Kentucky, it is the world's second-largest restaurant chain after McDonald's, with almost 20,000 locations globally in 123 countries and territories as of December 2015. The chain is a subsidiary of Yum! Brands, a restaurant company that also owns the Pizza Hut, Taco Bell, and WingStreet chains. Havelock City is a large mixed-use real-estate project in Colombo, Sri Lanka. The Residential component of the project consists of 8 residential towers and the Commercial component of the project consists of a 46-storey office tower and a Shopping Mall built to international standards. It is popular for its clubhouse, 7-acre garden, and the overall size of the project. The first 4 residential towers, namely Park Tower and Elibank Tower, and Layards Tower and Davidson Tower, were completed as at early 2017 with 22 floors each, and is currently occupied by residents. Phase-3 is currently under construction, and will consist of the Stratford Tower and Melford Tower, with 28 floors each. Piling for Phase-4 was done with Phase-3 to expedite development. Both phases is estimated to cost over US$130 million. Cargills (Ceylon) PLC is a Sri Lankan Retail, FMCG, Banking and Restaurant company which is listed on the Colombo Stock Exchange. The controlling interest in the company is held by Ceylon Theatres PLC. John Keells Holdings PLC (JKH) is Sri Lanka's largest listed conglomerate in the Colombo Stock Exchange. From managing the largest number of hotel rooms in Sri Lanka to owning the largest private-sector-owned transportation business in the country, providing port and marine fuel services to IT solutions, manufacturing of food and beverages to running a chain of supermarkets, tea broking to stock broking, banking to real estate, JKH has made its presence felt in virtually every major sphere of the economy. It began as a produce and exchange broker in the early 1870s. Aitken Spence PLC is a Sri Lankan blue chip conglomerate with operations in South Asia, the Middle East, Africa and the Pacific. Listed in the Colombo Stock Exchange since 1983, it has major interests in hotels, travel, maritime services and logistics. The group also has a significant presence in printing, plantations, power generation, financial services, IT, BPO/KPO sector, elevator agency services, garments, and property development. Ceylon Tobacco Company PLC (CTC) is a Sri Lankan tobacco company engaged in the manufacture, marketing and export of cigarettes. It is a subsidiary of British American Tobacco. CTC is the second largest company traded on the Colombo Stock Exchange. CTC enjoys a virtual monopoly in the manufacture of cigarettes in the country. Cigarette brands marketed by CTC in Sri Lanka include Bristol, Capstan, Dunhill, John Player Gold Leaf, Lucky Strike, Pall Mall and Three Roses. Majestic City is a seven-storey commercial and shopping complex which is located in Bambalapitiya, Sri Lanka, near the Bambalapitiya Railway Station. C.T. Land Development PLC is the owning company of Majestic City.The late Mr. Albert A. Page is the founder chairman of the complex. Majestic City is considered as Sri Lanka's most sought after 'Destination Center' incorporating a diverse range of shopping outlets, a food zone, supermarket, children's amusement center, banks and the popular Majestic Cineplex. 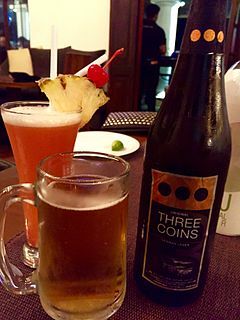 Three Coins is a Sri Lankan beer brewed by McCallum Breweries (Ceylon) Ltd, a subsidiary of Cargills Ceylon PLC. The Arcade Independence Square is a shopping complex in the city of Colombo in Sri Lanka, housed in a group of renovated buildings including the former Jawatta Lunatic Asylum and the former Western Provincial Council Building. It was built as a part of the Independence Square Redevelopment programme initiated by the Sri Lankan Government. Iranamadu Tank is an irrigation tank in northern Sri Lanka, approximately 3 mi (5 km) south east of Kilinochchi. Jetwing Jaffna is a hotel in the city of Jaffna in northern Sri Lanka. The seven-storey 55 room star class hotel is located in the heart of the city on Mahatma Gandhi Road, next to Cargills Square. The hotel was built on land purchased in 1975 by N. U. Jayawardena, former governor of the Central Bank of Ceylon. Originally intended to be a fourteen-storey 76 room hotel, construction began in February 2012. Owned by Yarl Hotels, a joint venture between Jetwing Hotels and MMBL Group, the Rs. 1 billion hotel opened in April 2016. Cargills Bank Limited is a licensed commercial bank in Sri Lanka. 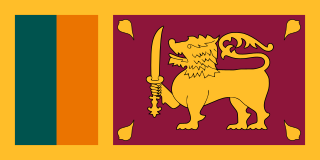 It received its license from Central Bank of Sri Lanka to operate domestic and offshore banking business on 21 January 2014 and was ceremonially opened on 30 June 2014. At present the bank consists of 17 branches island-wide with the head office based in Kollupitiya. Union Bank of Colombo PLC, commonly referred to as UBC, is a commercial bank in Sri Lanka. It is licensed by the Central Bank of Sri Lanka, the central bank and national banking regulator. Velupillai Suppiah Thurairajah was a Sri Lankan Tamil architect who designed many buildings in Sri Lanka and abroad. ↑ "Cargills to invest 500mn in Jaffna". The Daily Mirror (Sri Lanka) . 14 September 2011. ↑ "Cargills shows the way with biggest private sector investment of Rs. 500 m in Jaffna". Daily FT . 15 September 2011. ↑ "Cargills shows the way with biggest private sector investment of Rs. 500 m in Jaffna". Press Articles. Cargills Ceylon PLC. 15 September 2011. ↑ "Cargills Ceylon PLC Provisional Financial Statements Nine Months Ended 31 December 2013" (PDF). Colombo Stock Exchange. p. 1. Archived from the original (PDF) on 2014-03-15. Retrieved 2014-03-15. ↑ "Cargills Square, Jaffna". MMGS Architects. ↑ "Cargills Square opens in Jaffna". The Sunday Times (Sri Lanka) . 23 February 2014. ↑ "Sri Lanka- Jaffna gets a 15 storied Star Class hotel". News.lk. 2 February 2012. Archived from the original on 2014-03-15. ↑ "Former war zone to get 'cineplex'". The Island (Sri Lanka) . 18 September 2011.